On average, Invisalign® treatments take 12 to 18 months to achieve the desired results, according to the product manufacturer. During that time, patients need to meet periodically with their dentist so he or she can evaluate their progress. These check-up appointments are important because some patients need interproximal reduction (minor shaving of the teeth’s edges) or the temporary setting of buttons to resolve crowding or guide tooth movement. Here, Dr. James Altomare discusses Invisalign appointment frequency and discusses how many visits are needed. Contact our Skillman, NJ office to find out if Invisalign is right for you. Invisalign is an advanced orthodontic treatment that uses personalized clear plastic trays to gently correct the alignment of your teeth. Each aligner is worn for two weeks at a time, guiding the teeth into their desired positions. Candidates for Invisalign typically have gapped, crowded, or uneven teeth. Patients must also be in good oral health before this cosmetic procedure can begin. How Often Will I Need to Have Dental Appointments? Once you have started Invisalign treatment, you will need to wear the clear braces for 20 to 22 hours per day. Each tray is designed to last two weeks before being replaced. Throughout your treatment process, Dr. Altomare will schedule regular visits, usually every two or three tray placements, to examine the progress of your treatment. 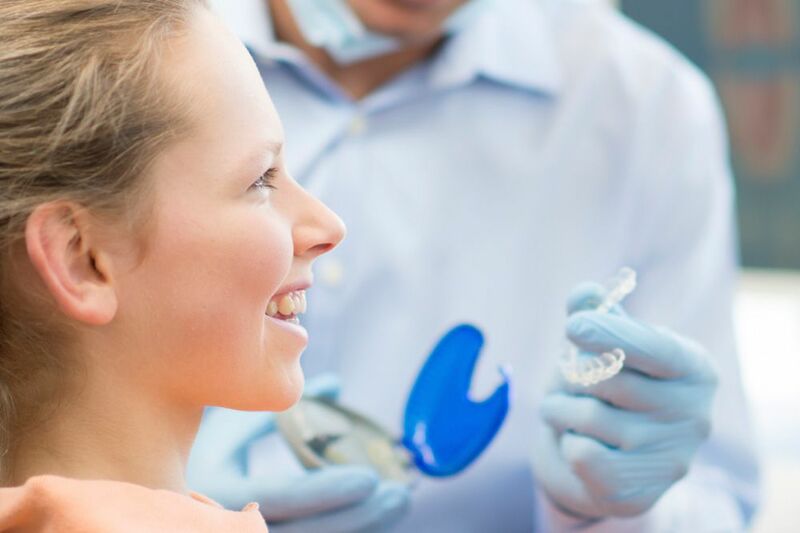 If you are experiencing discomfort from the aligners or have questions about Invisalign, these appointments are a good time to discuss these issues with Dr. Altomare. Once your alignment trays have all been used, Dr. Altomare will take final measurements of your teeth to create a Vivera® retainer to wear at night. The nightly use of this retainer will help you maintain your beautiful new smile. To resolve issues such as overcrowding, interproximal reduction (IPR) may be needed. The process (which typically uses diamond-coated strips to grate small amounts of enamel off) creates very small amounts of space between adjacent teeth to allow movement during treatment. Buttons are small tooth-colored attachments that allow the aligners to grip certain teeth. Throughout your treatment process, buttons may need to be strategically placed and removed as your teeth move. To ensure you get the best results from your investment, be sure to follow these basic tips. Provide honest feedback to your dentist: Dr. Altomare’s goal is for you to be 100 percent satisfied with the Invisalign process and, most importantly, the results. Wear your alignment trays 20 to 22 hours per day: Failure to wear your trays for the proper amount of time may delay your treatment’s timeline. Clean your trays daily: To maintain good oral hygiene, brush your aligners daily just as you do your teeth. Regular appointments allow Dr. Altomare to ensure that your dental transformation goes smoothly. From the initial consultation that uses 3D modeling technology to map out your treatments, to the final appointment where you are fitted with your retainer, Dr. Altomare and our staff will guide you every step of the way. To begin experiencing the benefits of Invisalign treatments, contact our office online or call us at (609) 921-1020.